Material and Finish: "Raven Black" powder-coated steel cable railing posts with wood top rail. 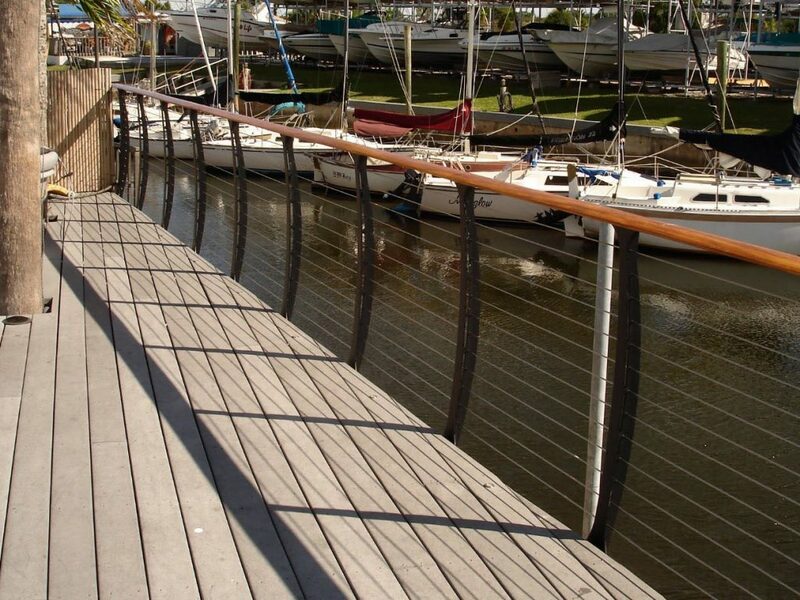 The beautiful Palm Harbor sits 23 miles west of Tampa and 28 miles north of St. Petersburg’s downtown. Named appropriately for the acres of palm trees that line the seaside, Palm Harbor leads out to the alluring Saint Joseph Sound and past that, the Gulf of Mexico. 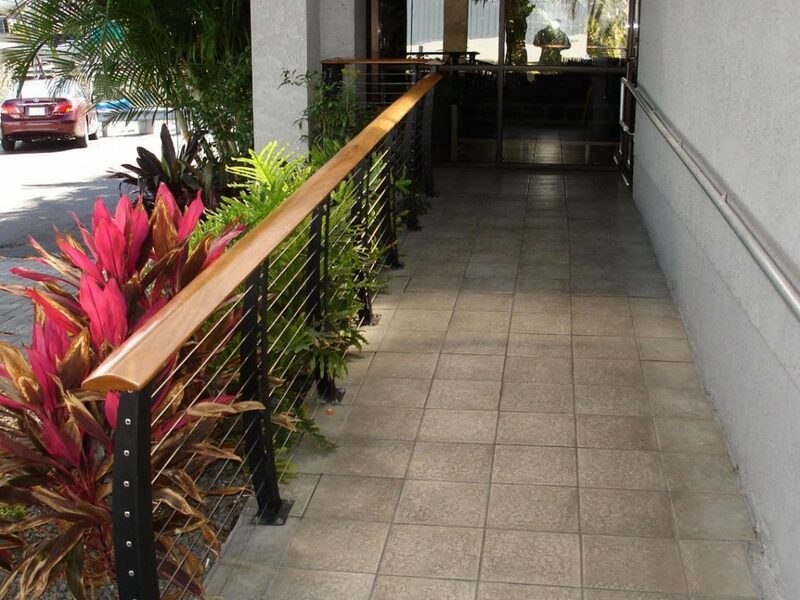 The luxurious Home Port Marina resides within Palm Harbor. This full-service marina features plenty of docking space and amenities like a fish cleaning station, swimming pool, hot tub, showers, and a restaurant, the Ozona Blue Grilling Company. 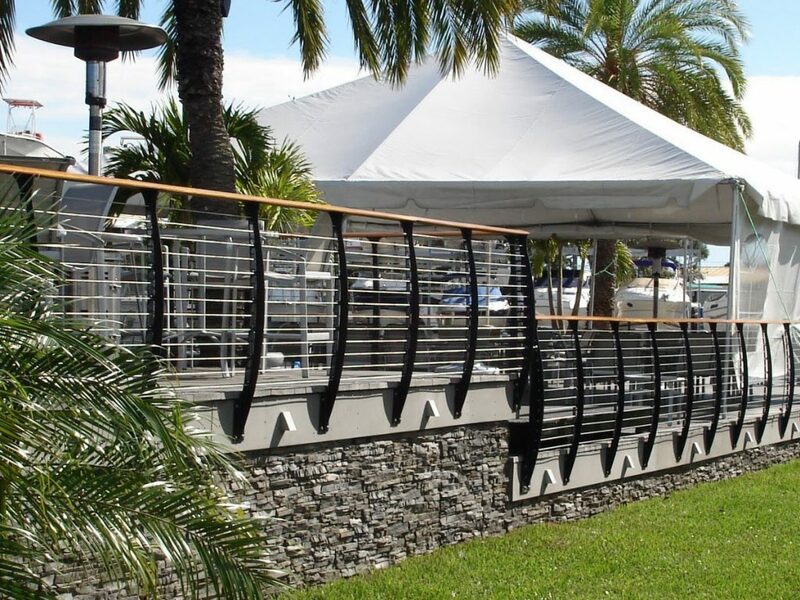 When the owner of Home Port Marina began planning renovations for the restaurant, he needed to install a new railing system. 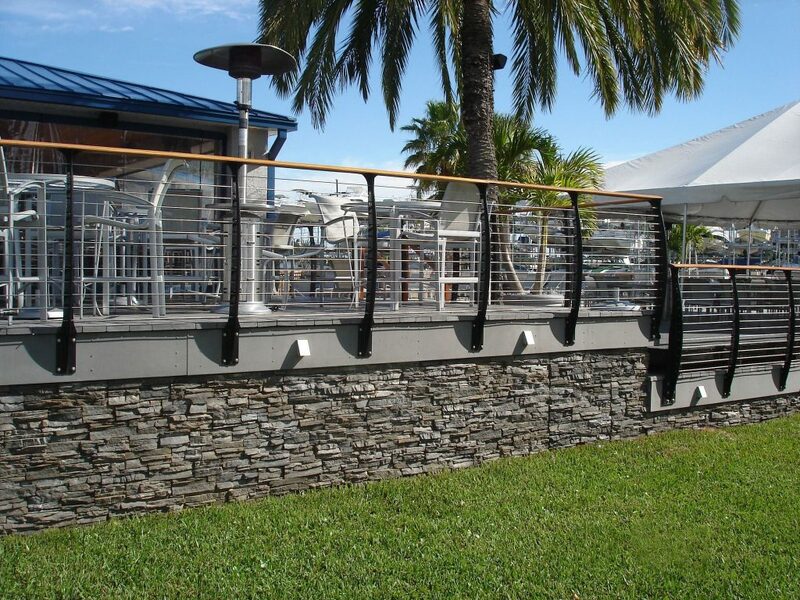 He knew he wanted cable railing to preserve the restaurant’s natural view of the harbor. The owner also saw if fitting that cable infill reminded him of sailboat rigging. 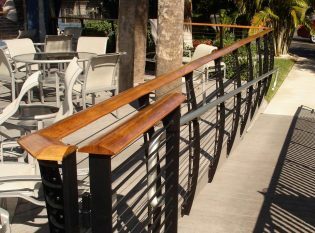 In his research for the renovation project, he came across our Keuka Style cable railing and instantly knew that it was the perfect design choice for the restaurant. He loved the curvature of the railing posts and thought its nautical appearance would suit the marina environment. 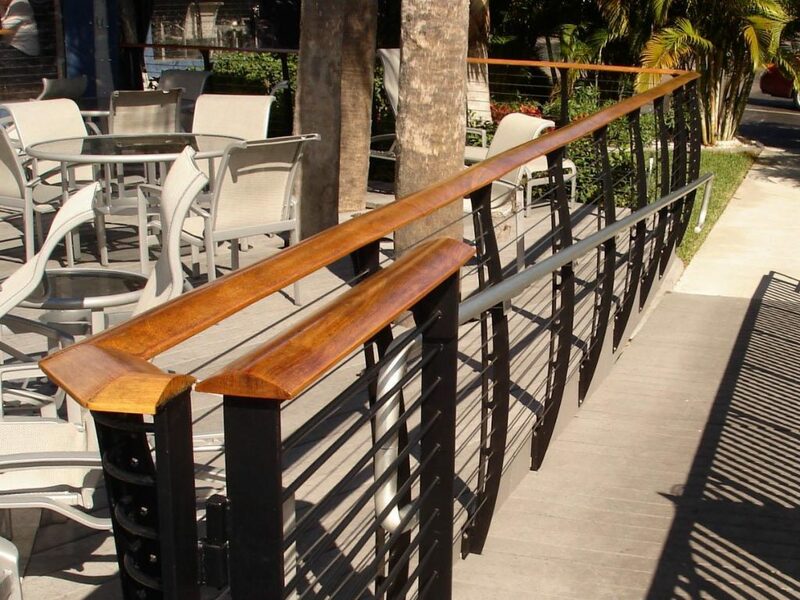 For the restaurant railing system, we chose a custom-milled cumaru wood handrail. 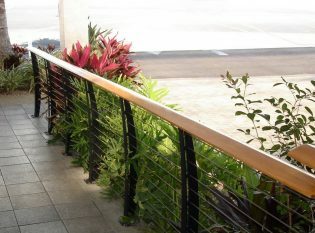 Because saltwater environments can accelerate corrosion, we chose hot-dip galvanized and powder-coated steel posts for the railing posts. 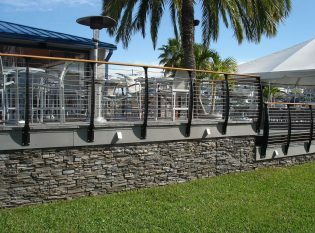 With the restaurant’s outdoor seating area now complete, you can sit outside and enjoy fresh seafood and your favorite cocktail while you look out at the undisturbed view of the water through our Keuka Style cable railing.